These particles that are ‘on-the-mass-shell’ or ‘Linga’, that follow the Energy-Momentum relationship are ‘observable’ and also become observers participating in interactions (Karmana). Those that do not obey the Energy-Momentum relationship are said to be ‘off-the-shell’ and Virtual. Virtual particles are not observable. They are 'implied'. In a sense they do not exist independently. They are mathematical intermediate steps. We can consider them as our understanding ‘gap’ or a mathematical trick. Nevertheless they are extremely important in our understanding. The root of ‘Manas’ is ‘Man’, which means ‘imagine’, ‘think’ etc.. Manas means something ‘tacit’ or ‘implied’. Manas are the Virtual particles or Implied particles, those that are ‘off-the-shell’ or not on linga. This is how it is used in the Vedas. When Upanishads tried to explain this Vedic ‘manas’, they could infer that manas is something virtual or implied or implicit. But they could not relate it to science or the quantum fields. Hence they related it to a philosophical domain and provided explanations around ‘manas’. This philosophical approach got extended in Puranas and other commentaries. But Upanishads often quote the original slokas as such. They use terms like ‘It is said in that sloka’, which indicates they are explaining the meaning of something that was told to them. They clearly indicate that the sloka itself did not originate from them. ‘Manas’ indicates Virtual Particles, that are not observable, which are off-the-shell, which can travel back in time, which can travel faster than light, but needed to fill in the gaps of our understanding. From this understanding of manas, manas the virtual particles in Vedas become ‘Mind’ in Upanishads, Puranas and several vedic bhasyas of later days. Attributes of Manas like that 'Speed of Manas is the highest' or 'Can travel back in time' actually belong to Virtual particles. According to Quantum theories, Virtual particles can be ‘off from the mass-shell’ at various levels. At times they can be close to on-shell or Linga, or nearly obey/disobey the Energy-Momentum relationship. At times they can be far ‘off-the-shell’ or does not obey the Energy-Momentum relationship. When a virtual particle is extremely off-the-mass shell (At-manas) it is called At-man. At means farther off or the extreme. Atman is extremely off-the-mass-shell or extremely implied or extremely virtual. This extremely virtual Atman becomes the 'Self' and leads to the idea of consciousness in the philosophical domain. More about it in the later sections. But in general, longer a virtual particle exists in excited state, the more closely it adheres to the mass-shell relation. A "virtual" particle that exists excited for an arbitrarily long time is simply a real particle. That is it is on-shell or on Linga or obeys the EM relationship. However, all particles have a finite lifetime, as they are created and eventually destroyed by some processes. In practice, the lifetime of "real" particles is far longer than the lifetime of the virtual particles. So when manas (virtual) is ‘excited’ for longer times it becomes pracetas (Real). Cetas means visible. Pracetas are those visible observable real particles. ‘Brah-man’ means the expanding/growing/evolving implicit/implied/virtually one. This virtual/implied expansion or growth or movement is called ‘Evolution’ in scientific terms. The Universe's expansion and growth from quantum fields to particles to more complex matter and beings is called Evolution. Evolution is virtual or implied as it cannot be isolated out of its domain of existence. It is perceived. It is understood. But it cannot be identified as a separate item much like Manas, Atman and virtual. This expanding, ever evolving growth is Brah-man. 1. 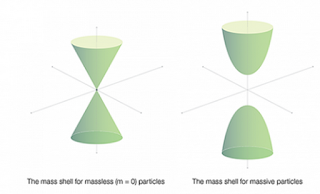 Manas are virtual particles that cannot be observed. They are ‘off-the-mass-shell’ or off the Linga. They are just a mathematical intermediary step or can say a gap in our understanding. They do not obey Energy-Momentum relationship. They travel back in time. They can travel faster than light etc. But Manas is closer to EM realationship than Atman. 2. Atman is far off from the EM relationship. Atman is far off-the-shell. 3. Manas, the virtual particle excitations if it exists long enough becomes pracetas the real visible particles.Pracetas are real particles that can be observed. They are on-the-shell or on the Linga. They obey Energy-Momentum relationship. They cannot travel back in time. They cannot travel faster than light. 4. Brah-man is virtually expanding/growing one which is evolution. A Quark-Antiquark meson, say a pion can be Manas (virtual) as in a nucleus or Pracetas (real) as in other reactions. In fact several particles could be virtual or real depending on the environment. Hence the word Pracetas (or real) is often used as an epithet for Varuna, Agni, Daksha etc, which often have a virtual and real form. When Manas (virtual, unobservable particles) remain sufficiently excited for a long time, it tends to obey the Energy-Momentum relationship and become Pracetas (real observable) particles. What is this Excitation..? manMada is excitation of ‘manas’ or virtual particle. ‘Mada’ means excitation. Manmada is excitation of manas or implied/virtual excitation. If manmada is implied/virtual excitation, kAma simply means excited state. In quantum mechanics, an excited state of a system (such as an atom, molecule or nucleus) is any quantum state of the system that has a higher energy than the ground state (that is, more energy than the absolute minimum). Excitation is an elevation in energy level above an arbitrary baseline energy state. This excitation is Manmada. The lifetime of a system in an excited state is usually short: spontaneous or induced emission of a quantum of energy (such as a photon or a phonon) usually occurs shortly after the system is promoted to the excited state, returning the system to a state with lower energy (a less excited state or the ground state). This return to a lower energy level is often loosely described as decay and is the inverse of excitation. akAma - These are De-generate ground states, which are without excitation. A particle could have several de-gennerate ground states it returns to at different times. AptakAma - These are meta-stable states which are excited states but stable states. Then there is Atma-kAma. Atma kAma are excited states of the extremely implied/implicit/virtual particles. Such extremely virtual particles, which are far off-the-mass-shell, even when excited, never become real or observable particles, as they have to persist for a long duration to be real. They always remain virtual excitations that die out. kAma is normally translated as desire. Kama is excitation or an excited state. Desire manifests as an excitation in human beings. It gets them into an excited state. When we desire something, that something introduces an excitation in us. It puts us in excited state. Since desire puts us in excited state, kAma is used to denote Desire. When Shiva (Energy) gets excited (moves to excitation level) in a Quantum System, the excitation does not last long. The excitation or kAmA burns up, decays, energy is given out and the system returns to a more stable energy state (ash). This is how the Puranic story of Shiva burning kAma was probably born. When Shiva (Energy) is aspected by kAma (excitation/elevation) in a particle, the particle acquires momentum (Shakti) along with energy (Shiva). That is Shiva and Shakti are united due to kAma. It leads to particles acquring specific energy types like Chemical Energy, Thermal Energy, Electro-magnetic energy etc. These six types of energies are called the skanda or Skanda is said to be born of Shiva and Shakti. When virtual particles gets into an excited state (kAma enters the manas) and it remains there sufficiently long time it becomes real observable particles. That’s how the Universal evolution started at the origins of Universe. That’s what science says. But that’s what also Rg Veda Mandala 1 Hymn 129, Nasadiya suktam states. Nasadiya Suktam depicts the origins of the Universe. It says “At the start of time, before that, KAma got seeded in the Manas at first”. The whole Universal creation is a result of that kAma (excited state) getting seeded in Manas (Virtual particles), leading to particles being attached to on-shell (Linga), thus producing real observable particles. This excitation for a longer time leads to real, observable particles on which the Universal evolution happens. That/they (tat) only/alone (eva) attach together (saktah saha) with their ‘inter-action’ (karmaNa) in this manner (iti). Thus is the (iti nu) excited state (kAmAya) virtual particles (mAnah). The excited (kAmAya) virtual particles (mano) when they get linked/attached to the mass-shell (linga), they become real, observable and they take part in ‘inter-actions’ (karmaNa). In whatever interactions between the particles, the end of their interactions remain on-shell or inside this world. Therefore all their interactions come back to this world. This is how excited (manas) virtual particles do. But then those in degenerate ground states, devoid of excitations in vacuum state, meta-stable states, those excited states of the extremely virtual, they do not ascend the prAna or life. They remain merged together with quantum fields of spacetime. But this is traditionally translated this way. The man who desires (transmigrate). But the man who does not desire (never transmigrates). Of him who is without desires, who is free from desires, the objects of whose desire have been attained, and to whom all objects of desire are but the Self—the organs do not depart. The sloka says ‘It is said that’ (tad eSa sloka bhavati). It means the sloka starting with ‘tad eva saktha..” is dated prior to the Upanishad itself. It is from some other text or a sruti, which the Upanishad is trying to explain. Traditional translations use this sloka (tad eva saktha karmana iti) to explain a similar principle in philosophical domain. In a philosophical domain, manas the virtual becomes mind, kAma the excitation becomes desire, spacetime becomes brahman. Then it just means to say that if we give up the desires we are merged in brAhman and if we have desires we keep ending up in this world. As one can see in the traditional interpretations, it talks about human beings, while sloka is very generic. The word Linga is not well explained. But that’s what philosophy around science can do. It can extract concepts from science and apply it to human life. It is good as long as it does not obfuscate science and become de-facto science. I can assure that till now I have not obfuscated science with 'philosophy' of any kind in this series. Manas is clearly differentiated from 'thought' in our scriptures. It is clearly identified as something that is beyond buddhi, Citta and Ahamkara. Yet due to the attribute of high speed 'Manas', 'traveling back in time manas', people often confuse it with thoughts in our brain. For eg. 'manojava' means Speed of manas and NOT speed of thought. But we end up visualizing manojava as speed of thought. 'Manojava' is said to be one of the 'tongues' of Agni. It is the speed of virtual particles that is greater than the speed of light. Agni is Exchange force or transfer of energy. In the coming posts, I will describe the seven tongues of Agni in Quantum mechanics view-point later. I will also describe Rudra, the Quantum fields, from the view of Exchange forces (Agni) as Trika-Agni-kAla. I will also describe the Eleven Rudras or the Eleven Quantum fields. Manas is the 'Virtual' attribute of all matter and beings, living or non-living. As we will see in further chapters, Manas is the 'binder' of all matter and beings. Citta, the ability to transact information is the 'real' attribute of all matter and beings, living or non-living. It is the 'thoughts' in our brain and is a result of electrical signaling. Hence it is lesser than speed of light and much lesser than the speed of manas, the virtual particles. Ahamkara is the attribute of all living beings including primitive organic compounds. Ahamkara introduces a sense of 'I' distinct from surrounding matter that provides ability to protect oneself and grow further. Buddhi is the attribute of Intelligent beings, the ability to logically analyze information and react. But let's stick to early Universe Quantum domain and early universe evolution for now, as Aditya Hrdayam is all about it. We started with Shiva (Energy), shakti (Momentum), Rudra(Quantum fields), Brahma/Hiranyagarbha (Gravity/Spacetime) and went onto Linga (On-mass-shell), Manas (virtual), Pracetas (Real) and reached Atman (Extremely Virtual/Implied), Brahman (Implied Expansion/Growth or Evolution). Manas though it is 'virtual', it is closer to 'real' than Atman, the extremely virtual. Manas, the virtual particles play an extremely important role in evolution of Universe, or so we understand them. Without 'Manas' the virtual particles, our Universe might not have had baryons, mesons and nucleus of atoms. Or that is atleast our understanding. We need 'manas' the virtual particles to make our understanding of this Universe complete in many respects. Let’s understand what all ‘Manas’ does and how Manas, the virtual particles influences the whole Universe and helps in Universal evolution, perfectly matching it with science in every way, in the coming sections. The first Manu, the Self-born Manu, (Svayam-bhuva Manu), the embodiment of 'Manas' the virtual particle crosses over into 'real' particle and helps Universal evolution. I will also talk about the Eleven Rudras or the Eleven quantum fields, Trika-Agni-KAla, the Seven tongues of Agni etc before moving back into understanding more on Varuna and Indra. I will also be talking about various Rishis, Manasaputras and their role in Universal evolution matched with what exactly science says.